Eons ago, a peaceful tribe lived in the mountains, enemies surrounding it on every side. To escape, the people sent out scouts to search for a new home in the valley. Help the budding Aztec Tribe gain a foothold in the ancient world by mining resources and constructing buildings. 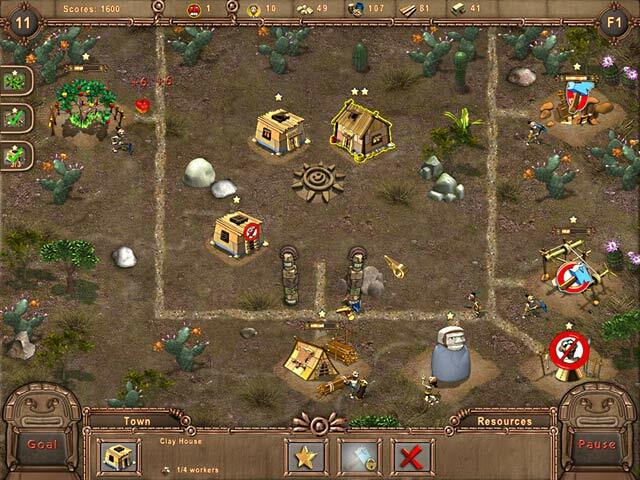 Then upgrade your structures to attract more citizens, train soldiers and ward off the attacks of a heartless enemy in this fun time management game. 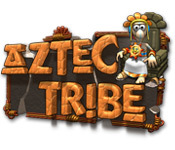 Aztec Tribe is rated 3.1 out of 5 by 7. Rated 4 out of 5 by kajunman from Fun but aggravating Fun to play and get all the goals. Once the fire and lightning start then it becomes a real challenge. It would be better if you had things you could make to stop these things from happening as much. Dig a well to help with fires, lightning alter to pray to the lightning god. 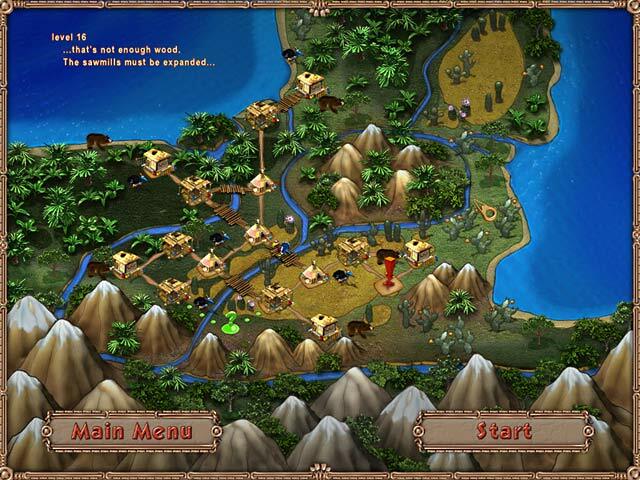 The final levels are spent repairing and rebuilding your village because of fire and lightning. The fun was gone for me after level 27. Up to that point it was fun after that more aggravating than fun. Rated 4 out of 5 by s_kane24 from Fun! A good game. I will buy the second one too! 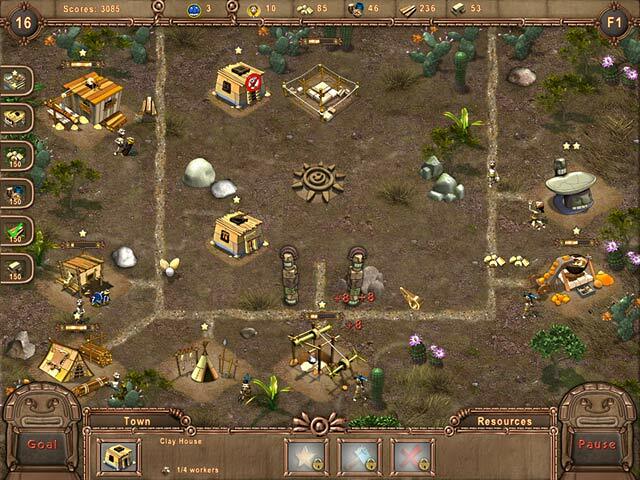 Rated 3 out of 5 by SumrBrz33 from Aztec Tribe I didn't find this game very much fun to play. It was monotonous .. I kept watching the clock to see when my free trial was up. Rated 2 out of 5 by IvanRic from Hard to keep playing This is a pretty straight forward resource management game. It can be fun at first, but I never felt the sense of accomplishment once a level was finished. Rated 2 out of 5 by DrDavid from The game that COULD have been To begin with, this is a resource management game rather than a time management game. Time isn’t kept but resources are limited and you must have a plan and use it to achieve your goals. Excellent concept. That works well for me, but then there are the every 5 to 10 second ‘disasters’ which interrupt game play and aggravate you to wits end. The disasters ruin plans and lengthen level play to as much as 30 minutes per level. Then the next level you begin at scratch again. Finally it just gets doggone boring. Excellent concept and poor execution. I’m on level 25 but the game is so boring I would rather read e-mail or straighten my stereo wires. I never counted, but my garden, producing food, burned to the ground about 10 times the last level. Boring. Oh, how good this game COULD have been and missed. Alas, I could almost recommend it but not quite. The graphics are OK but the game moves along in a herky-jerky fashion when the animation engine seems to run out of resources. Another example of ALMOST a great game. Overall, this is a FAIL.